Two unannounced phones have appeared on the Virgin Mobile web site. X-tc: The X-tc was first seen a month ago and details about the X-tc have also been published on the Kyocera site. The X-tc is a slider with QWERTY keyboard for messaging. It has a 1.3 megapixel camera, stereo Bluetooth, web browser, media player with dedicated control keys and preloaded applications such as MySpace and Facebook. It also has a slot for microSD cards, and a speakerphone. The X-tc costs $100. Jax: The Jax is a re-branded S1300 Melo that is available from other carriers such as Cricket and MetroPCS. 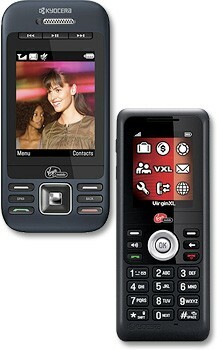 It is a simple bar-style phone that has access to basic features such as the mobile web and messaging. It also has a speakerphone. Pricing information was not revealed. The Virgin Mobile USA web site recently revealed details of an unannounced Kyocera mobile phone. The X-tc is a slider with QWERTY keyboard for messaging. Heard the Jax will cost $10. Seeing as how it's so cheap, and made by Kyocera, why not call it the "Junx"? A fitting name.